Check out one of the hottest trends in cycling and get a megadose of fun and fitness. You don’t have to do every ride in a nice aero tuck. All too often we grab the tri bike over our road bike. But even the pros include a balance of positions on different bikes – road, gravel and mountain biking. A variety of positions helps keep you mentally fresh and engaged, while also developing various aspects of your pedal stroke. Since summer is still months away, it’s okay to do a number of your rides out of aero. Spring is often dubbed gravel season in many parts of North America, with loads of cyclists grabbing their cross or gravel bikes – even fitting wider tires on their road bikes – and hitting the dirt roads outside of the city. Why this switch? First and foremost, it’s just so much fun to explore new routes and adventures. That dirt farm road you’ve ridden by dozens of times during training rides but ignored? Turn down it and see where it goes. That trail run that you love? Experience it completely differently on two wheels. Getting off pavement opens up a vast world of opportunities. Off the main roads, you can find wide hard-packed dirt roads, even some simple singletracks routes. This wide variety also extends to gravel events. Every event is unique in distance, terrain and challenges, but all emphasize physical challenge, fun and camaraderie – the same things we love about triathlons. Our friends at the Canadian Cycling Magazine listed several gravel races you can do this spring across Ontario. 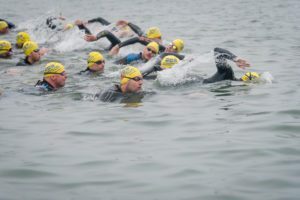 Triathletes have three disciplines to pursue and master, which offers lots of variety and cross-training opportunities. Despite this, cycling off-road can still help both your cycling and overall athletic development. Unlike the steady efforts we try to sustain in triathlons, riding off-road means that molehills become mountains, with even slight changes in elevation magnifying the power requirements. As a result, there are repeated bursts of power at relatively low cadences required while seated. The need to handle the bike around obstacles, along with the vibrations from the bumpy ground, also puts more demands on your upper body and core strength than typical road riding. Riding off-road can become a form of functional strength training. Make sure to drop tire pressure to maximize comfort and grip. Comfort and stability trump aerodynamics when riding off-road. For example, swap in spacers on the fork or flip the stem upside down. Swap out carbon wheels for more durable alloy training wheels. Unless you expect to be walking sections, your current road shoes and pedals will be perfectly fine. The spring is a perfect time to get in lots of base miles, watch the earth wake up from a long winter and add a few epic rides to your memory bank before getting dialled into the triathlon season. So, check out one of the hottest trends in cycling and get a megadose of fun and fitness.